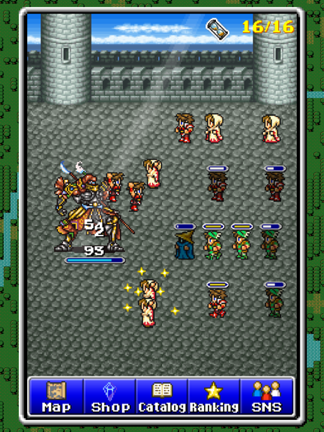 Despite the fact that I grew up playing Square Enix’s slew of Final Fantasy games, I have never bothered to seriously play one of its Final Fantasy ports on iOS. 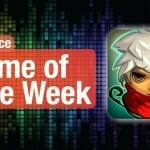 The main reason is the price – Square Enix routinely prices its apps far above the App Store norm, which maxes out at about $4.99. 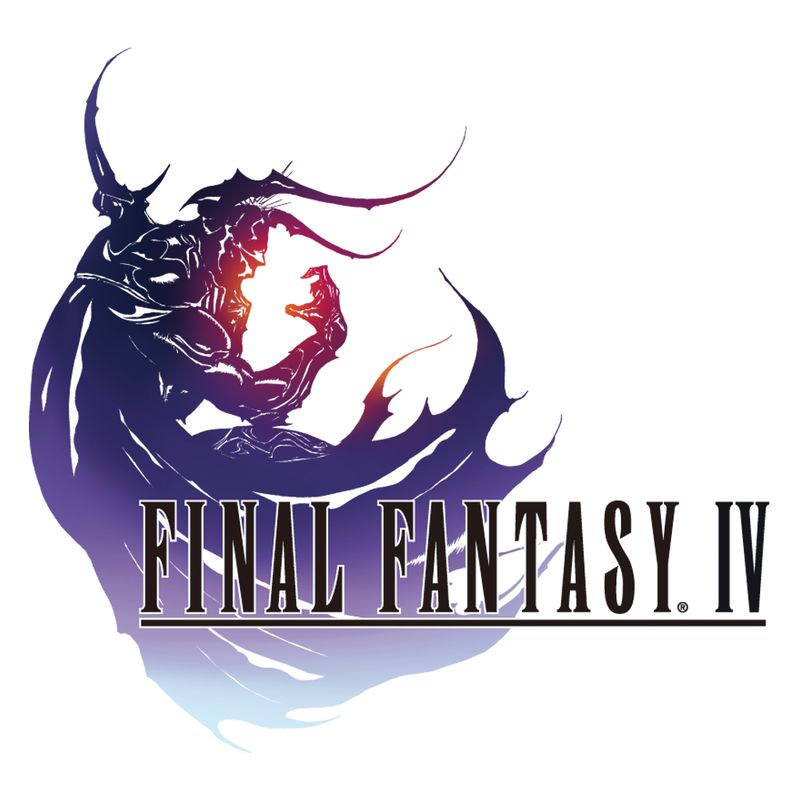 For example, Square Enix’s Final Fantasy IV, one of its best titles, costs $15.99. This is a game from 1991 that I’ve already purchased and played in the past. Final Fantasy Tactics: The War of the Lions, another favorite, is also priced at $15.99 and it’s not even universal. 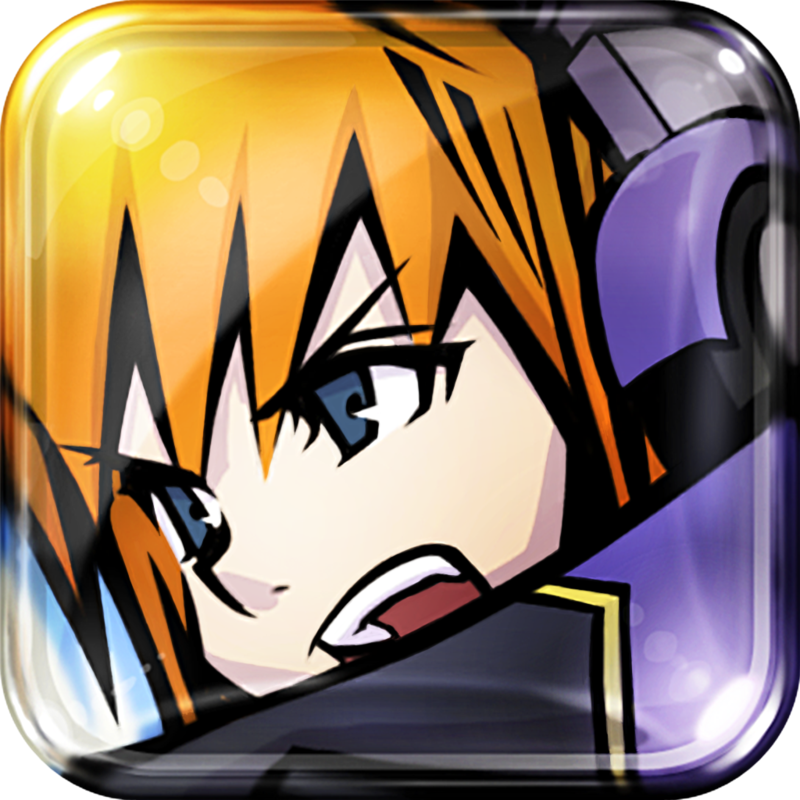 The World Ends With You was also split into two versions, and the iPad version carries a price tag of $19.99. Beyond the price, Square Enix ports rarely have new content and often don’t have iOS tailored controls, making them unappealing to players who aren’t stalwart fans of the series. 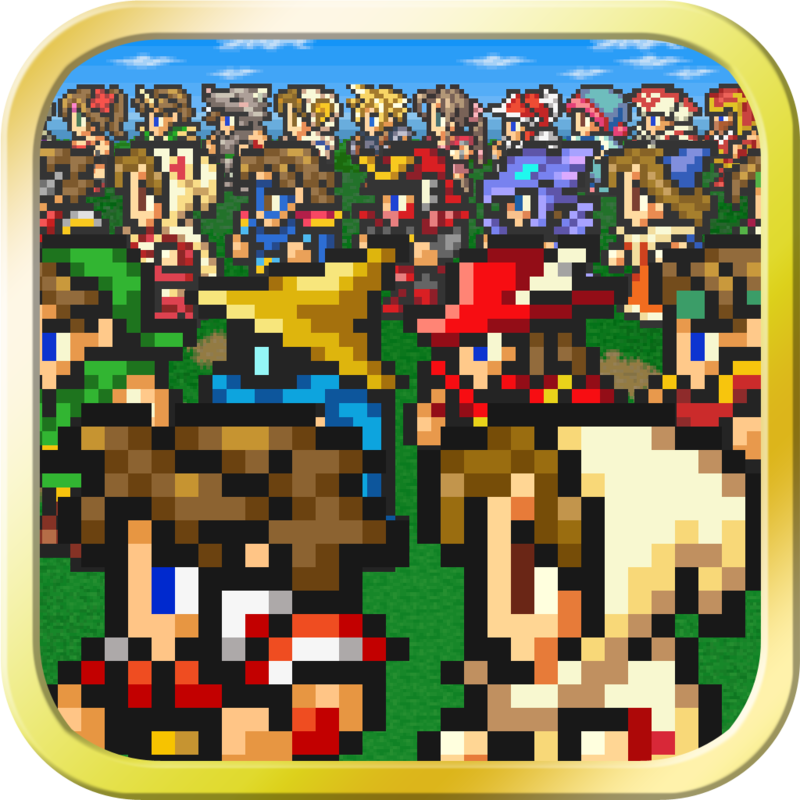 That changed with Final Fantasy All The Bravest ($3.99), a seemingly affordable universal app that promised to meld Square Enix’s vast Final Fantasy universe and a traditional RPG experience with casual gameplay. Unfortunately, while All The Bravest does incorporate the look and feel of a Final Fantasy game, in regards to art style, graphics, and characters, the similarities end there. This is a game with no storyline beyond an initial introduction, that thrusts you right into the simplistic gameplay. 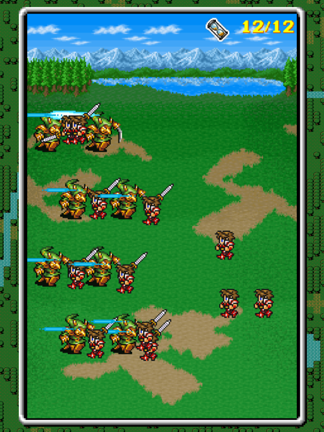 You do not need strategy, planning, or depth of thought to play All The Bravest, because gameplay consists of repeating the same swiping motion over and over again to send your characters into battle. Let me explain. 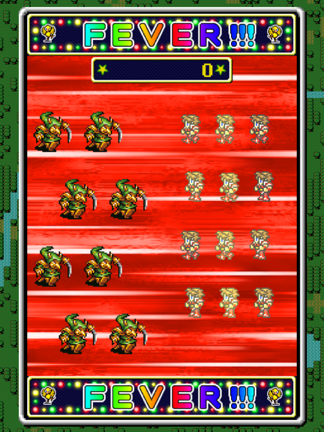 Levels are organized into a series of fights, from simple enemies you have encountered in other Final Fantasy games to bosses. 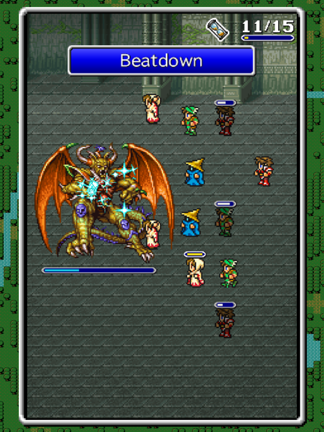 This is a game that claims to use Final Fantasy’s Active Time Battle system, but you cannot choose abilities, weapons, spells, or items to use when you fight. 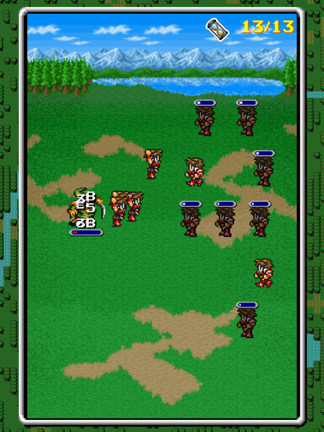 You can only tap on the characters on the board, which sends them to attack a line of enemies. 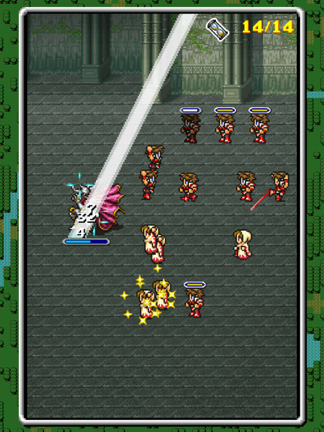 You tap a character, it fights, and then there is a cool down period before you can tap again to send it into battle. You can tap multiple characters in quick succession by swiping downwards on the screen, and the game becomes a battle where you watch for these timers and decide when to swipe to take out enemies. 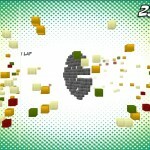 The enemies attack as well, and a single hit will take out a character, which can empty your party of fighters quickly. When your party dies, you must replace them with an hourglass, or wait for one party member to regenerate every three minutes. You receive three hourglasses when the game starts, but you must use real cash to purchase more, at the rate of $0.99 per three hourglasses. This becomes a serious problem during boss fights, which are essentially wars of attrition. You throw characters at the boss until it is drained of health points while it slowly whittles away at your party. The game graciously announces that these party members come back even when the app is closed, but it is a ridiculous game mechanic. If you leave the app open while characters regenerate, the boss will simply take them out again in a few seconds, which means you attack twice, die, and then wait another three minutes to regenerate. This is frustrating when a boss is nearly dead. There is a fever button which recharges every three hours, giving you an easier way to defeat bosses, but again, it is absurd to have to wait three hours to finish a tough battle. You can, of course, restart a battle from the beginning, but it is unlikely that swiping in a different way will give you a leg up. Long boss battles essentially require a significant wait, the investment of cash, or multiple attempts. 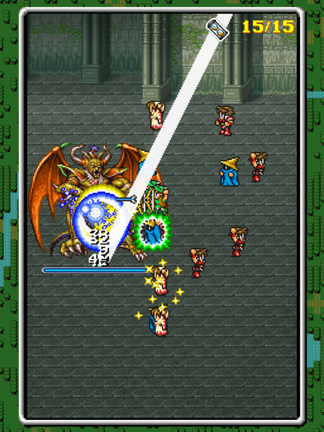 The game does have other RPG elements, and you will earn gil (that is not used for anything) and items for defeating enemies that enhance your characters in a non visual way, as well as experience to unlock additional character slots, but it is impossible to overlook the game’s freemium mechanics to see any positive in other aspects of the game. To be honest, I would not be annoyed if it were a simple wait to play again, but the entire hourglass system seems to exist just to wring money out of the game. You might think that requiring hourglasses would provide enough income for Square Enix, but the company wants to squeeze every last penny that it can out of its fanbase, so it has made 35 “Premium” characters available for purchase at $0.99 each. These characters are significantly more powerful than your typical warriors, mages, and rangers, but you cannot choose which character to unlock. So if you have a favorite, you can only hope to get lucky. 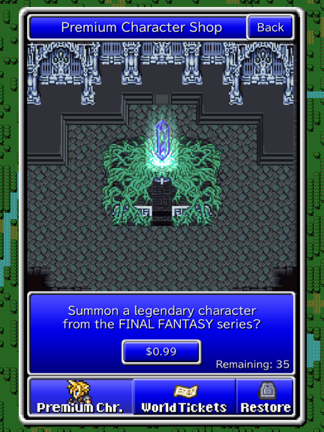 For that $0.99 in-app purchase, the game rewards you with a random character. Unlocking new areas in the game requires even more cash, at $3.99 per area (there are three). That’s $3.99 for the initial game, $12 for the additional areas, and $35 to unlock all of the content in this app, along with the purchase price of the hourglasses. That’s over $50. So not only is the gameplay simplistic to the point of being boring, the entire game is just a thinly veiled money making machine, designed to drain cash from the people most likely to download the app in the first place – loyal Final Fantasy fans. Do yourself a favor and stay away from Final Fantasy All The Bravest, as all you will be rewarded with for purchasing this game is a sense of disgust for Square Enix and the series that you once loved.